The Biggest Bear by Lund Ward, a 1953 Caldecott Medal Book, tells the story of a young boy who is ashamed that, of all of the families in his community, his is the only one who has not killed a bear and displayed its pelt. He goes into the woods to shoot a bear himself, but returns with a bear cub which he decides to raise. As the bear grows, it becomes a pest to the neighbors as it gets into the food they have stored, so they decide the bear must be taken away. Three times the boy takes the bear far away, but each time the bear returns home. Finally, the boy takes the bear yet another direction with plans to shoot him. As they get deep into the woods, the bear takes off running with the boy holding tightly onto a rope around the bear’s neck. They end up trapped together until a group of men from the zoo free them. They explain that they have been looking for a bear to take to the zoo and that this bear is an even bigger specimen than they had expected to capture. The boy is happy that the bear will be cared for and that he will be able to visit him. 1. “Excellence of execution in the artistic technique employed.” – Detailed pencil drawings seem so life-like that readers may feel as if they could jump into the picture. 2. “Excellence of pictorial interpretation of story, theme, or concept.” – Each picture clearly illustrates the storyline. 3. “Appropriateness of style of illustration to the story, theme or concept.” – Every page stays well within the style that could be imagined of a backwoods mountain community, especially within the mind of a young boy. 4. “Delineation of plot, theme, characters, setting, mood or information through the pictures.” – All of these criteria are well represented in the pictures, but the mood throughout the story is exceptionally illustrated through the emotions expressed on the faces each of the characters, including the bear. 5. “Excellence of presentation in recognition of a child audience.” – We all have enjoyed this book a few times, always experiencing vicariously the excitement, sadness, and relief of the boy as well as the curiosity, confusion, and satisfaction of the bear. 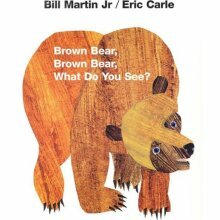 Summary: Brown Bear, Brown Bear, What Do You See?, written by Bill Martin, Jr. and illustrated by Eric Carle, uses colorful, simple illustrations to teach colors effectively to young children. The large pictures look as if they could have been created with torn pieces of construction paper and other simple art materials. My 2-year old son easily started repeating the colors to me and loved looking at the different animals. Pros: A fun method to reinforce learning colors. Eye-catching illustrations. Cons: The blue horse and purple cat may be a bit confusing for children. In some lights the red bird looks more pinkish, so could cause some confusion as well.